Even good girls like to raise the roof once in a while, and your bridesmaids are no exception! 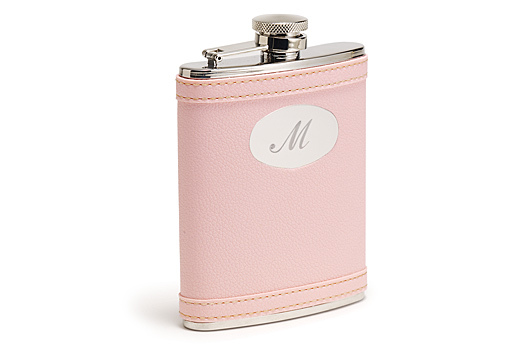 This pink leather flask holds seven ounces of their beverage of choice. It&apos;ll be a hoot to carry around at the bachelorette party -- and think of how sassy they&apos;ll look at your wedding after-party. Oval engraving plate can be engraved with up to three initials. Attached lid. 5" h x 3 3/4" w x 1" deep.